Want to know something kindamaybe crazy? I have never been camping. I've slept in a motorhome, a cabin, and some very questionable hotels, but never a tent. Never under the stars, on a bed of lumpy dirt, soothed to sleep by the swish-swishing of sleeping bags. But lately? Lately I've been having some weird urge to give it a try, but a hip injury from a car accident has made sleeping on the most comfy of beds difficult, so it will have to wait. In the meantime, tucked between physio, painkillers, and long waits to see specialists, I brought a little bit of camping to me instead. 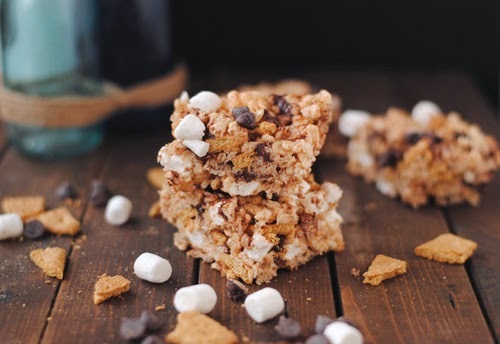 S'mores Rice Krispie Treats, made with browned butter, marshmallows, graham crackers, and chocolate chips. All melted together in perfect harmony. It's not the real deal over a campfire, but it's just as fun to share with your family. In a large pot (think dutch oven size), heat the butter until it begins to brown. It will smell kind of nutty and very delicious. Add the marshmallows and stir until just melted. Remove from heat. Stir in the rice krispies and graham crackers. Let cool for 5-10 minutes, then stir in the chocolate chips and extra marshmallows. Pat down, using wet hands, into a 9x13 baking tray. Let set, then serve! If you're anything like my family (gluttonous pigs) it will be gone before sunrise.